Cognified Marketing and Selling Podcast | Listen Free on Castbox. Cognify is the "aha" moment before something is understood. Knowing people buy on emotion and justify their choices with logic, how do you incite emotion and supply the right data to close a sale, generate a lead or move a person to action? Getting COGNIFIED is the way! What the heck is Cognified? It's the past tense of Cognify, of course! Think of it like the person who had the "aha" moment and now has a good story to tell about the tools, tips and data they used to get there. They're now Cognified! The Cognified Marketing and Selling Podcast will feature interviews and stories with everyday people using innovative tools, ideas and strategies to work smarter, faster and more efficiently. After all, it's easy to hear how to market a medical practice, start a business, grow a territory or create a product from famous people with staffs, sponsors, and large budgets. What about the real people who get up every morning and work hard to serve their patients, clients, companies, and families? This is most of us and we are the majority of what makes commerce move! Cognified Marketing and Selling Podcast will feature those people because they have amazing ideas, strategies and stories about how to work smarter, more efficiently and effectively that all of us can use. Today. Perhaps you know of someone who has a great "system" they've developed through years of experience? Or maybe you do, too? If you do, we'd love to hear from you and interview you on our next episode. Please remember, this is a podcast about real people hosted by a guy who, once-in-a-while, uses some salty language. If that bugs you, you probably shouldn't listen and it explains the "explicit" label. The promise the Cognified Marketing and Selling podcast makes to you is that if you listen, you will learn, be inspired and maybe even say, "Hey, that guy's just like me!" So if you're one of the Working Doctors, Road Warriors, Phone Pounders, Solopreneurs, Product Managers, Brand Mangers, Content Marketers or anyone looking for a few good ideas, you've come to the right place. Stop back often and get COGNIFIED! 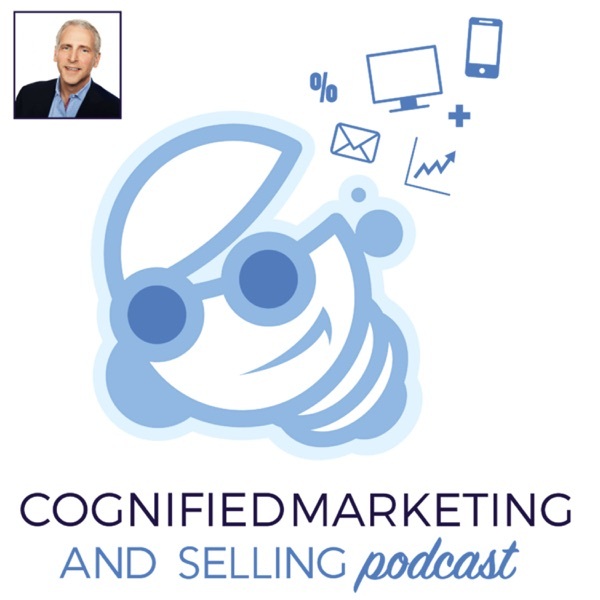 In this episode of the Cognified Marketing and Selling podcast, host Joel Gaslin sits down with Bill Wiley, MD of the Cleveland Eye Clinic and Amnon Keynan of Surgiorithm. Bill Wiley is a cataract and refractive surgeon in Cleveland, Ohio. ... Read MoreThe post Episode 16, Bill Wiley, MD Cleveland Eye Clinic and Amnon Keynan Surgiorithm appeared first on Make Marketing Easy - Joel Gaslin's Blog. Welcome to Episode 15 of the Cognified Marketing and Selling Podcast . When it comes to account management and Explainer videos, Dan Englander – Sales Schema knows a lot about the topics. Dan wrote four books about these topics called, ... Read MoreThe post Episode 15 – Dan Englander – Sales Schema appeared first on Make Marketing Easy - Joel Gaslin's Blog. If you’ve ever struggled with breaking through, fear or self -doubt, this episode of the Cognified Marketing and Selling Podcast is for you. Tyson Sharpe Emotional Fitness Coach was a fun guest to have on the show. Tyson Sharpe – ... Read MoreThe post Episode 14 – Tyson Sharpe – Emotional Fitness Coach appeared first on Make Marketing Easy - Joel Gaslin's Blog. The video is king today, and knowing if you’re doing it right is challenging. Mark Anderson – Creative Soul Video, is a 20 time Emmy Award-winning video storyteller and creative expert – he knows how to create videos that move ... Read MoreThe post Episode 13 – Mark Anderson – Creative Soul Video appeared first on Make Marketing Easy - Joel Gaslin's Blog. Michael Aronsky, MD – Kremer Eye Centers is a board-certified ophthalmologist specializing in corneal, cataract, and refractive surgery. Also, Dr. Aronsky is a graduate of Northwestern University’s Physician CEO program. Michael Aronsky, MD – Kremer Eye Center – Background After ... Read MoreThe post Episode 12 – Michael Aronsky, MD – Kremer Eye Centers appeared first on Make Marketing Easy - Joel Gaslin's Blog. Rick Wood is an entrepreneur who demonstrates grit, adaptability, a sense of humor and a desire to help others. It’s no wonder he’s enjoyed Van Allen Belt success building Cascade Mountain Tech and Little Hotties Warmers. Rick and I met ... Read MoreThe post Episode 11 Cognified Marketing & Selling Podcast with Rick Wood – Cascade Mountain Tech appeared first on Make Marketing Easy - Joel Gaslin's Blog. Stan Herrin is a humble person who is the founder and publisher of Outpatient Surgery Magazine (OSM), highly intelligent, makes hard concepts easy to understand, successful and a lot of fun to interview. You’ll hear in this 10th episode of ... Read MoreThe post Episode 10 – Cognified Marketing and Selling Podcast with Stan Herrin – Outpatient Surgery Magazine appeared first on Make Marketing Easy - Joel Gaslin's Blog. Jeff Peres – Everseat is the guest on episode 9 of the Cognified Marketing and Selling Podcast. Jeff’s a smart entrepreneur with good instincts who left Wall Street to pursue his dream. Learn about what he’s doing to help medical ... Read MoreThe post Episode 09 Cognified Marketing and Selling Podcast with Jeff Peres – Everseat appeared first on Make Marketing Easy - Joel Gaslin's Blog. Michael Koppelman is the Chief Technology Officer and former Head Brewer at Badger Hill Brewing in Shakopee, Minnesota. Michael founded Badger Hill Brewing with three other people and is putting all of his skills to work growing this exciting business. ... Read MoreThe post Episode 08 – Cognified Marketing and Selling – Michael Koppelman – Badger Hill Brewing appeared first on Make Marketing Easy - Joel Gaslin's Blog. Donald Downer is an Ophthalmologist with Clay Eye Physicians and Surgeons; a ten partner group focused on state of the art eye care serving northeastern Florida. Dr. Downer was an early adopter of Femtosecond laser for cataract surgery. Also, his ... Read MoreThe post Donald Downer, MD Clay Eye Physicians and Surgeons Episode 02 Cognified Marketing and Selling Podcast appeared first on Make Marketing Easy - Joel Gaslin's Blog.